Serve up this pud and soak up the praise. There’s no cooking involved at all – just a bit of whizzing and simmering, with a dash of creative flair. The decoration looks super-professional, yet it’s incredibly easy. 1. Grease and line a 23cm springform tin with baking parchment. 2. Make the base. Whiz the digestive and amaretti biscuits in a food processor to make fine crumbs. Tip into a bowl and stir in the butter. Spoon into the prepared tin and chill until firm. 3. Put the chocolate in a bowl resting over a pan of gently simmering water and allow it to slowly melt. Once melted, heat the cream in a pan with the icing sugar and liqueur until it just comes to the boil. Carefully fold it into the melted chocolate until smooth. Pour into the prepared tin on top of the biscuit base. Chill overnight. 4. About an hour before you’re ready to serve, make the praline. Line a baking sheet with a piece of baking parchment. Brush it with oil, then scatter over the almonds. 5. Put the sugar in a heavy-based pan and place over a low heat to allow it to slowly dissolve. Continue to heat, shaking the pan every now and again so the sugar dissolves easily, until it has turned into caramel and is a dark toffee colour. Quickly pour the caramel over the almonds and ensure they’re evenly covered. Allow to cool. 6 When ready to serve, carefully lift the tar t out of the tin, peeling away the paper around the side and from the base (use a palette knife or fish slice for this bit). Transfer to a serving plate. 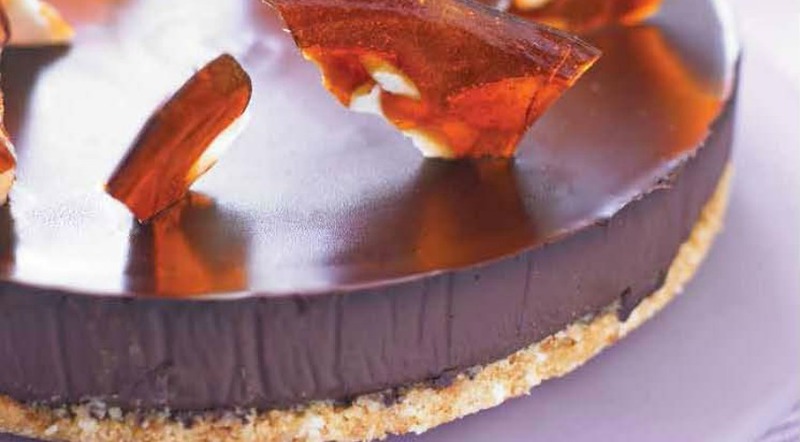 Roughly break up the caramel into shards and arrange on top of the tart. Serve immediately.